Is bacon paleo-compliant? Not really. It’s too heavily processed. Including it in a Stone Age diet is a nod to convenience and variety. 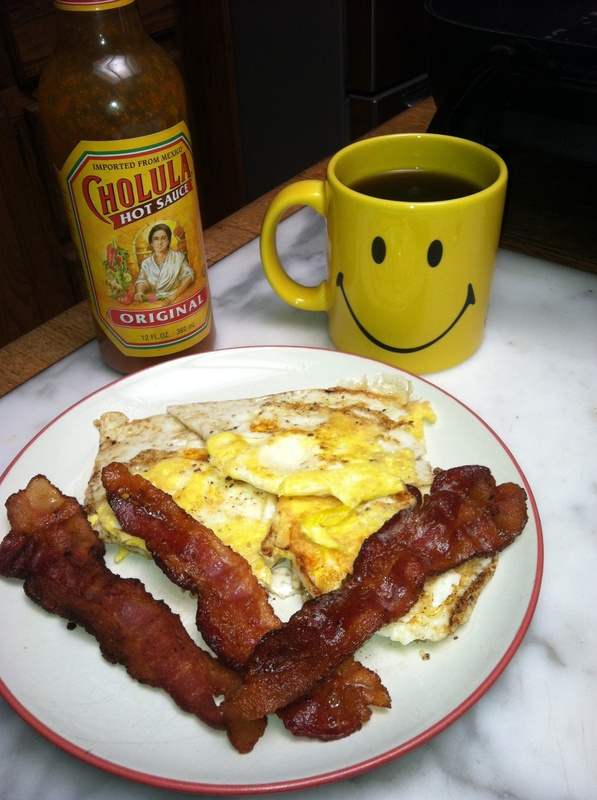 Bacon, eggs, black coffee, and Cholula hot sauce. A caveman wouldn’t recognized any of this except for eggs. If you follow nutrition science literature, you’ll see periodic references to “processed meats” like bacon contributing to increased risk of cardiovascular disease, cancer, or premature death. I think the associations are pretty weak. I don’t want to debate it right now. Health-conscious cautious people aren’t going to go hog-wild on processed meats. I don’t. We may never have a definitive science-based resolution of the issue. If you want to control the degree of processing in your bacon, make your own. The recipe at the link includes pink salt (sodium nitrite), maple syrup, and dark brown sugar. Many other recipes are available, some of which could be more paleo-compliant. My understanding is that sodium nitrite is a preservative and gives bacon meat that pink color. Does it contribute to flavor? If you’re not storing your bacon for a long time, you may not need the pink salt. In any case, I thoroughly enjoyed three strips of bacon with my eggs yesterday. Mine was the Kirkland brand from Costco was $3.80/pound (USD). Two slices provide 80 calories (uncooked) and zero grams of carb although, if I recall correctly, it was honey-cured bacon. Fry the bacon over medium or medium-high heat. If there’s too much grease leftover in the pan after cooking, poor out what you don’t want, for later use or drizzle over your dog’s dry kibble food. Leave a little grease in the pan so your eggs don’t stick. Then fry your eggs over medium heat. Enjoy with raw honeydew, which will cleanse your palate after eating bacon. Prominent features: high in B12, riboflavin, selenium, protein, pantothenic acid, and phosphorus. Although this is low in calories, it’s adequately satiating because of the rich protein and fat content. The calorie count will be higher by 50 if you eat all the bacon grease. By the way, I didn’t start a grease fire when cooking this. But I thought about it. After I poured excess grease out of my pan, some of it dribbled onto the outside of the pan. If I had put that pan back on a gas stove to cook my eggs, would that outside grease have caught fire and crept up into the pan? How do you put out a grease fire? I knew water wouldn’t do the trick; my first thought was pour salt on it. That’s wrong! About.com says to simply smother it by putting a metal lid on the pan and turn off the heat. If you can’t find the fitted lid, use a cookie sheet. Fire won’t burn without a supply of oxygen. You could pour baking soda on the fire, but it takes a lot. Wikihow has more info on putting out a grease fire, mentioning a dry chemical fire extinguisher as a last resort if you’re going to handle the fire yourself. Think safety first. Grease fire? Put a lid on it and turn off heat. 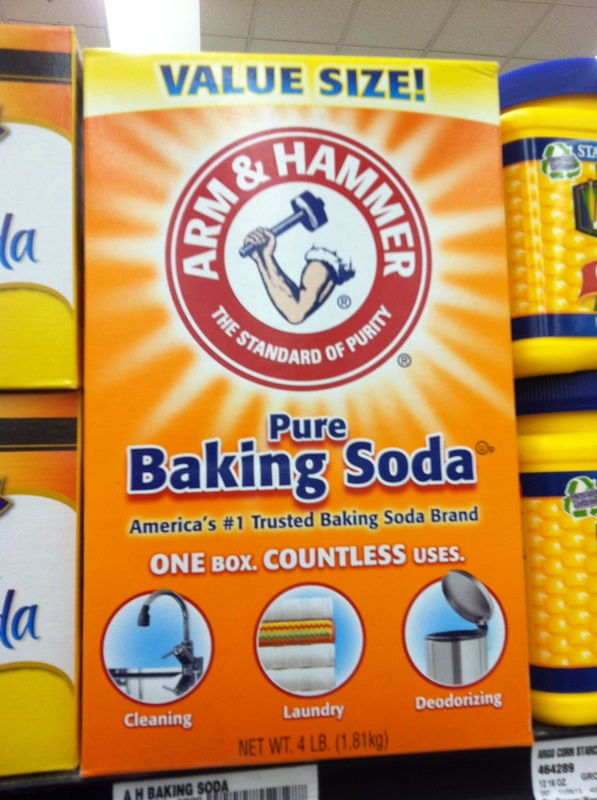 If that fails, try a LOT of baking soda. Or fire extinguisher. 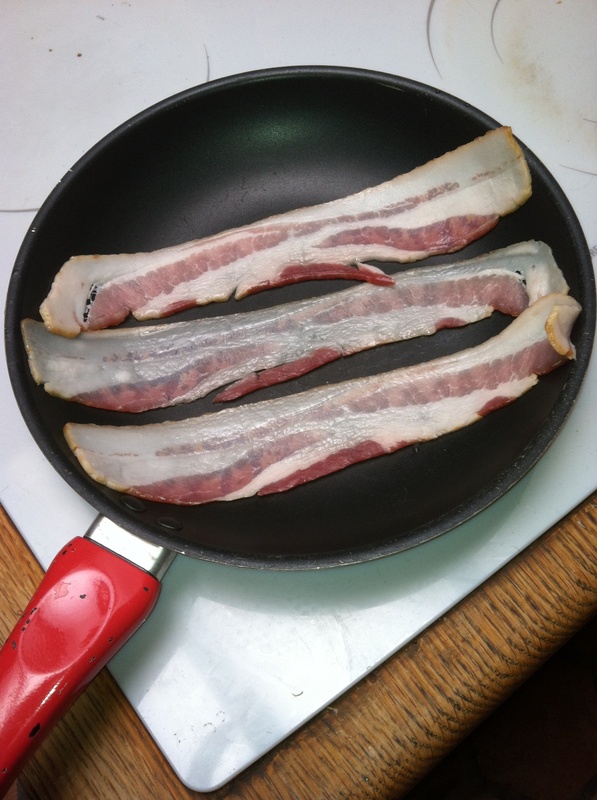 This entry was posted in Recipes and tagged bacon, breakfast, eggs, grease fire, low-carb, Paleobetic Diet, recipe. Bookmark the permalink.